More English articles on the issue can be accessed here. In India, death has a myriad ways to prey on hapless children and sniff the life out of them. Often, it has rather trustworthy accomplices: the union and state governments. Take but one way it strikes, killing more than a thousand each year. Since 1978, when it first struck, it has never failed to collect its annual toll of more than a thousand. That is just the reported ones. It has killed, in total, more than 50,000 children to date. Much death, and much culpability, given that the affliction responsible has not only been curable but also has an effective vaccine to combat it. 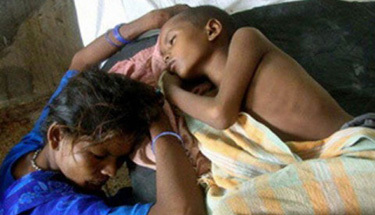 Encephalitis killed 1256 children in 2012, as per the government’s own admission. The most conservative independent estimates pegged the number at above 1480, gingerly warning that the actual numbers could be much higher as the estimates have only been culled from those children fortunate enough to make it to hospitals, even if only to die. Yes, the children are fortunate if they make to the hospitals for nothing more than dying as it lessens their pain a little. Though this is sickening enough, continue only if you can stomach more of this macabre tale of death and disease that plays itself out annually. Of the reported fatalities, 557 are from a single state, Uttar Pradesh. More than 500 of these 557 died in one hospital. This statistic is one of the few in this grim tale that makes sense. The Nehru Hospital affiliated to Baba Raghav Das Medical College of Gorakhpur in Uttar Pradesh is the only one equipped with facilities to treat Acute Encephalitis Syndrome (AES) and the Japanese Encephalitis, commonly known as ‘brain fever’ that has, since 1978, been endemic to region. Actually, no, allow this writer a correction. The Nehru Hospital is not the only one equipped with the facilities to fight the killer mosquito born disease in question; it is the only equipped one with doctors. There is one more, established by the state government of Uttar Pradesh after getting sternly rebuked by the National Commission for Protection of Child Rights (NCPCR). The NCPCR rubbished the steps claimed to have been taken by the state government as ‘nothing more than claims’ and held its ‘casual approach’ being ‘solely responsible for the death of the children’. In response to such a clear proclamation of its criminal culpability, the government of Uttar Pradesh has designated the District Hospital of Kushinagar as another nodal one equipped with all facilities to deal with encephalitis. The state government had assured the Commission that the hospital would run twenty-four hours a day. The facts behind the assurances were unmasked when local media found neither doctors to run emergency services nor any special intensive care unit, crucial to treatment of the disease, when it visited the facility in November 2012. ( http://aajtak.intoday.in/story/with-a-budget-of-billions-of-children-crematorium-1-714360.html). One may comprehend the level of blatant disregard displayed by the state, if one considers that 501 children had died in the region by 15 November, counting just 2012, as per the admission in the Rajya Sabha of the then Minister of State for Health and Family Welfare Mr. Sudeep Bandhopadhyay. If this is the fate of a district hospital, one designated to be a nodal facility to combat the affliction, need one talk of the primary health and community health centers attached to it? HALITIS?SITE=AP&SECTION=HOME&TEMPLATE=DEFAULT), and this before the full onset of monsoon, when fatalities peak. That 118 children are already dead again this year is a telling comment on both the preparedness and the sincerity of the government in tackling the problem. And it is not as if the authorities did not see it coming. The recurring deaths in this continuing catastrophe are nothing akin to the natural disasters that catch authorities and the citizen unaware and wreak havoc. Also, the government is fully armed to track and fight the disease, with 54 Sentinel and 12 Apex Referral Laboratories dedicated to maintaining surveillance and preventing such deaths. With the annual toll mounting once again, what these facilities do seems to be anybody’s guess. The seriousness of the problem had forced the High Court of Uttar Pradesh to take suo moto cognizance way back in 2006. The Court had then directed the union and state governments to declare the encephalitis affliction as a national health emergency and draw “a concrete action plan” to tackle it. The directive, as expected, fell on deaf years. Later, in 2011, the then Union health minister Ghulam Nabi Azad compared the disease to an epidemic and promised all measures to contain it. Noting correctly that the outbreak was caused mainly by water borne enterovirus, and not vector borne Japanese Encephalitis (JE), it would take a closely coordinated effort from the ministry of water management, rural development, health and the social welfare department, to arrest the spread of the disease. Needless is to say, again, the concerned departments have slept on the proposal. Even the incumbent provincial government took note of the disease last year and promised sustained action against the killer disease, with the help of a massive immunization drive. It too has slept on its promises until, through annual spike in the afflicted; the disease has knocked on the government’s doors again. The state government emerged from its slumber and hurriedly convened a meeting with the Chief Secretary Jawed Usmani, the top bureaucrat of the state, directing officials to ensure the construction of a fully-functional paediatric intensive care unit (ICU) in BRD Medical College by July 15. A drive, aiming at complete vaccination of 30 lakh people by June, and completion of a 100-bed encephalitis ward at the same medical college were the other measures announced. The wakening is a bit too late, again. The fate of the proposed vaccination drive fared the worst, of all measures announced. The programme, which has not yet taken off in reality, has failed even those who got one dose of the vaccine, as the required dosages are two. Local health officials, for a change, are not to be blamed for this, as they are often short of the vaccines. The worst thing about the disease, unfortunately, is not the deaths it causes but the survivors it leaves behind. It leaves victims physically and mentally challenged, for life. The records of BRD Medical College corroborate the fact. For the 35,000 children this facility has seen dead, the numbers of those permanently debilitated is estimated at anywhere between 10,000 and 20,000. The fate of these children often turns out to be worse than those dead and gone as they become a permanent ‘burden’ on their impoverished parents fighting for their own survival. There is no dearth of such children getting abandoned at railway stations and other crowded places. There is also no shortage of tales of parents who refuse to let go of their wasted children, with relatives urging them to abandon the same. One can tend to blame some of the parents, victims of the system, for cruelty, but the reality is what the NCPCR has stated in no uncertain terms. It is the government that is ‘solely responsible’ for ‘death of the children’ caused by its extreme apathy and inaction. It is the government that finds no funds for vaccination, for building additional hospitals to take the disease head on, and to provide better sanitation to eradicate the very root of the problem. It is the misplaced priorities of the government that counts the hapless children that die, while wasting public money on building theme parks and distributing laptops. It is the government which has abandoned the children. The poor parents have to abandon their children to protect the lives of the surviving ones. It is the governments which fails them, and fails the constitution of India, which makes it the duty for the government to protect its citizens. It is the government that treats the weakest section of the population as expendable. It is also the national media that lets them do so with impunity, for Gorakhpur is far away from the reach of cameras and sound bytes. And, it is the civil society that fails to see that these lives are being taken away without ‘due process established by law’, even while it protests against capital punishment. The system has made survival costlier than death for these children. Let’s keep counting the deaths till it improves itself.